Marrickville has always been known for it’s great food selection. However rather than Greek delis and Vietnamese bakeries, a new breed of cooks are in town. 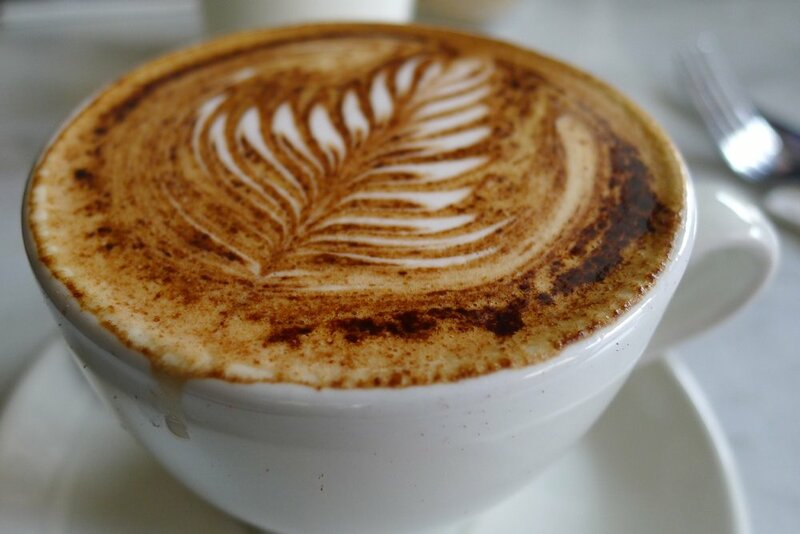 Cornersmith caters for the food and coffee needs of Sydney’s modern young professionals, as well as stylish surroundings for them to get together and socialise. 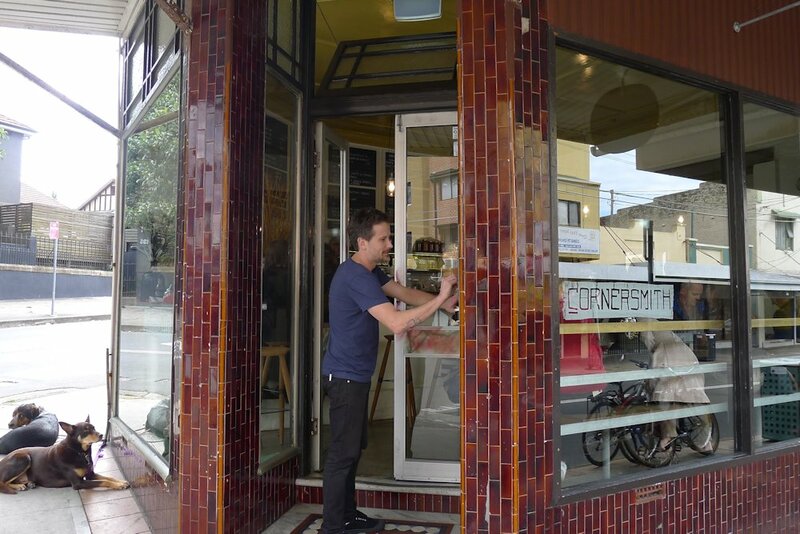 Much like Reuben Hills, The Grounds and Three Blue Ducks, Cornersmith is a new café that has become the flavour of the month (or couple of months). They all have a few things in common: lots of reviews, queues and best of all, great food! At Cornersmith we write our name on the chalkboard hanging outside the door and head to the back of the line snaking up the street. Arriving just before eleven, our wait is about thirty minutes (for a table for five). Talking with Mark, the owner, he explains that the menu changes on a monthly basis and includes as much local and seasonal produce as possible. So you can always expect something new (and unique) at Cornersmith from the sandwiches to the milkshakes and the stews to the cakes! Some of us are disappointed when we don’t find any bacon on the menu, however there are some tasty alternatives in place. 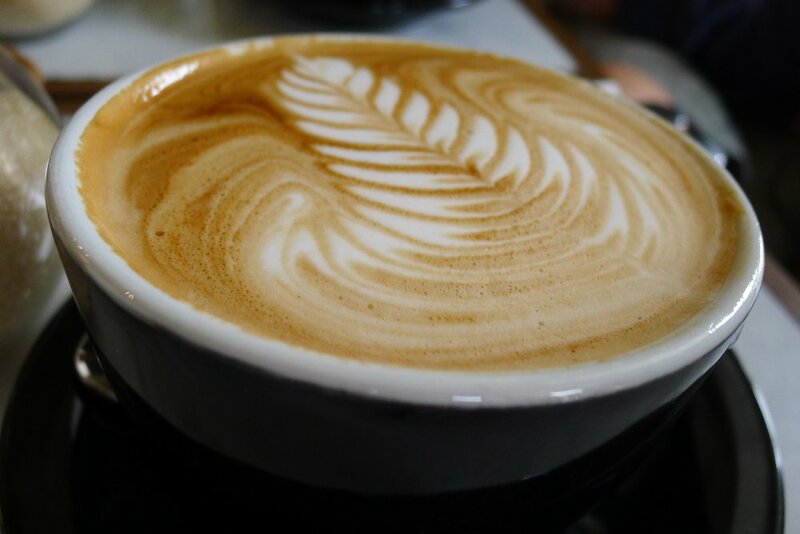 Once seated in the cosy interior we are still back to back with customers waiting for takeaway coffees. Finally there is a lull and we find ourselves in pleasant conversation and have a bit more room to breathe. If there is only two of you we suggest a counter seat as you get a great view of the cakes on offer and can watch the chefs work their magic. Overall we find the service friendly and fairly prompt. One of the young servers seems a bit dumbfounded by all the commotion but is doing his best! 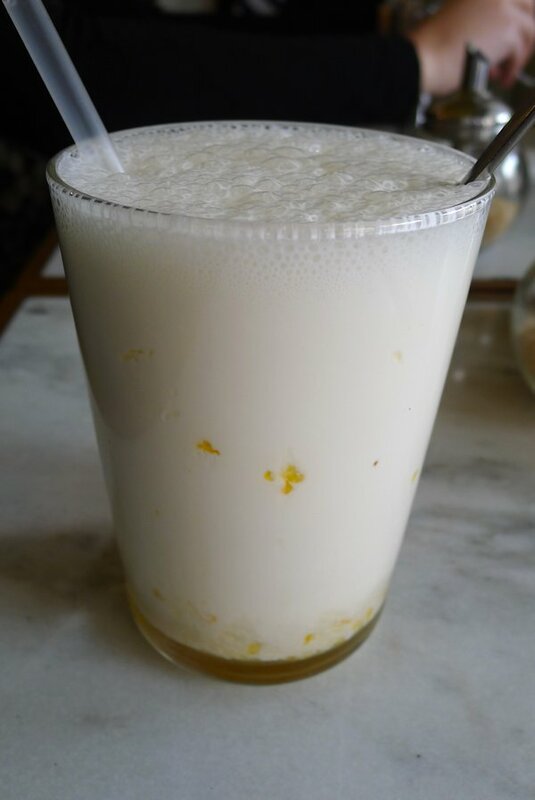 This week’s milkshake is mandarin and star anise (kids $4, regular $6) which seems to be more smoothie than milkshake because of the yoghurt. Either way we can say that Cornersmith know their flavour combinations well. This is superb. 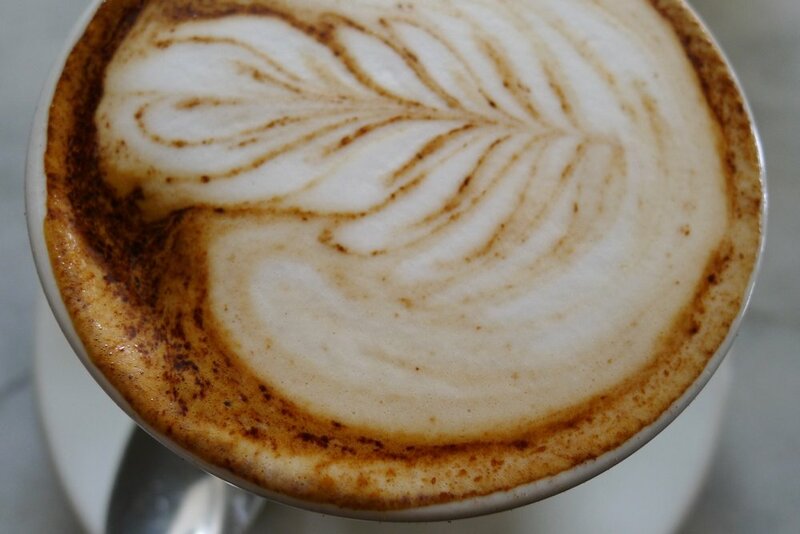 The coffees are very beautiful, made from Mecca Espresso beans. Our table has mixed reviews from fair to great. However we send one of the cups back as it still had lipstick on it! Despite this, judging by the crush of patrons, the coffee (takeaway regular $3, large $3.50, dine in regular $3.50, large $3.50) is well sought after. 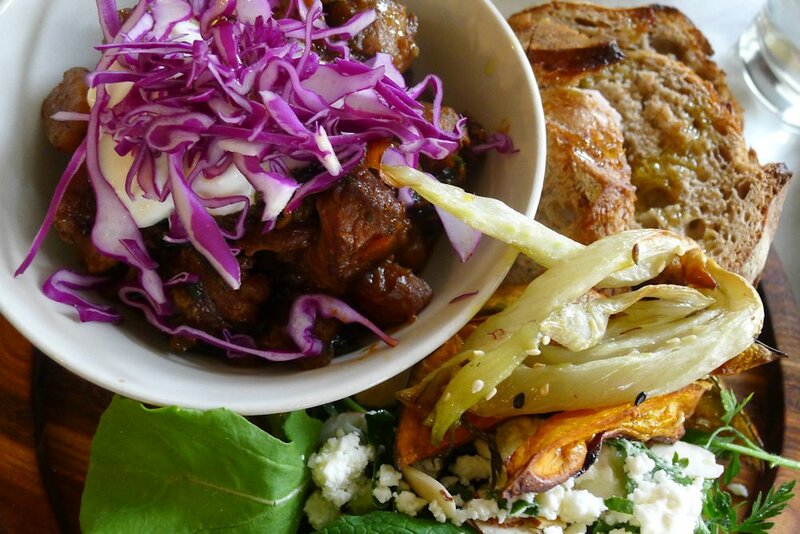 The month’s Cornersmith plate ($18) is based around a goat & stout stew which is a perfect winter warmer. It features tender pieces of meat and a fragant stew base however Dane prefers more stew liquid to dip the toast into. The salad on the side is pumpkin & feta with a wide variety of mixed greens. Some of the leaves are quite uncommon for salads, so be prepared for some new flavours. The sardines and avocado with zataar ($12) is one of the best dishes at the table. 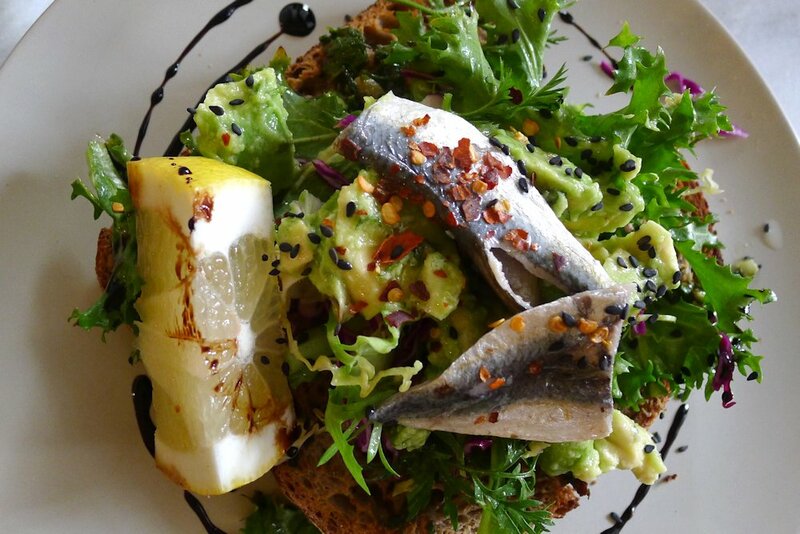 Beneath the sardines and ripe avocado are wild green pesto, salad greens and rye bread. The pesto has a fresh, clean flavour with a hint of olives and is a hit amongst most of us. The free range poached eggs with quince, pumpkin chutney and sourdough toast ($9) is (currently) available with one of four sides: honey roasted carrots with orange, fennel & sesame seeds, radish salad with orange, fennel, yacon, endive & feta, pasture-raised ham or (as one of our guests has) avocado with zataar & herbs (all sides $5 each). Once again the flavour combos are a hit. Every item has a unique flavour thanks to herbs and spices. The chutney will make you want to buy a whole bottle! 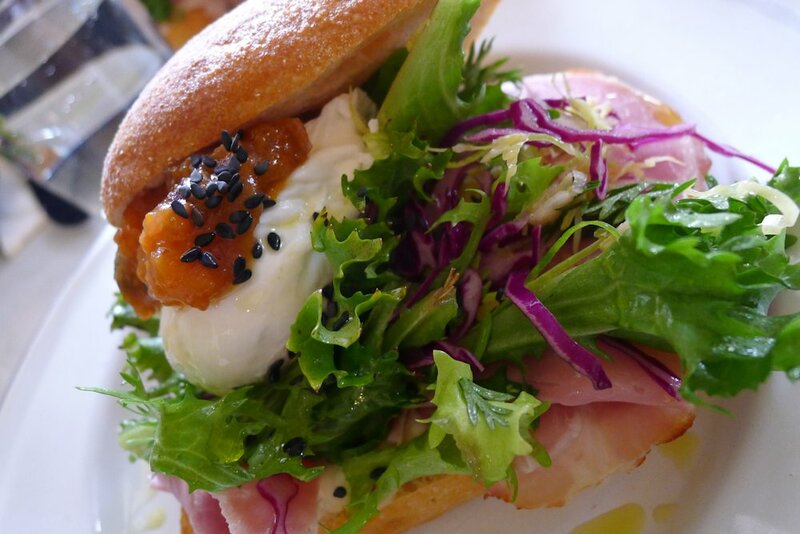 Two people at the table ordered the poached egg roll with pasture-raised ham ($12). It’s a mammoth roll and requires two hands in addition to a knife and fork. As we said above, the chutney has such great flavours and it goes well with the soft egg and fresh ham. It is a satisfying dish that will fill you right up. The special sweet item on the menu today is a baked pear, orange and strawberry with ricotta on rye ($10). 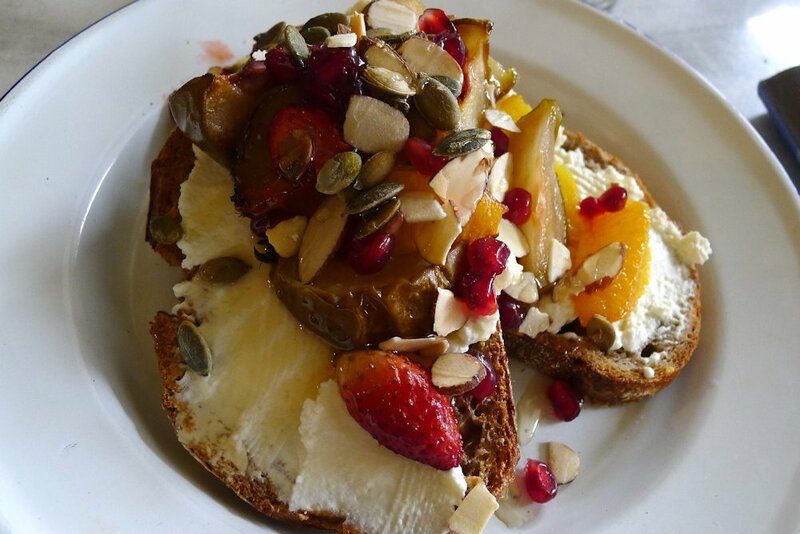 A great mix of fruit and savoury, they also throw in pomegranate and pumpkin seeds. We find this a healthy dish to share that isn’t sickly sweet. We think it’s always good to dine somewhere that tries something new. While you may never see the above dishes again, Cornersmith have a dedication to taste and produce which will be sure to please. Before heading home we can’t resist purchasing a bottle of their home made lemon lime cordial ($16) as well as their vegetable bouillon ($14) Hopefully they can expand to cater for the crush of customers because most rumbling stomachs can’t stand the long wait before being served. 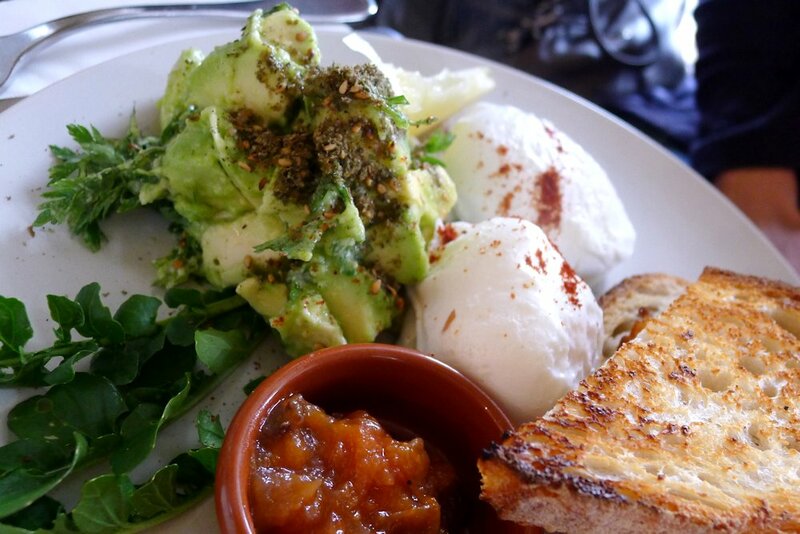 This entry was posted in Sydney - Inner West and tagged Eco friendly, Free range eggs, Fresh fruit and vegetable stores close by, Gluten free options, Organic Options. Bookmark the permalink. This is probably my absolute favourite cafe in Sydney at the moment. It actually makes me want to eat fresh seasonal fruit and veggies all the time. 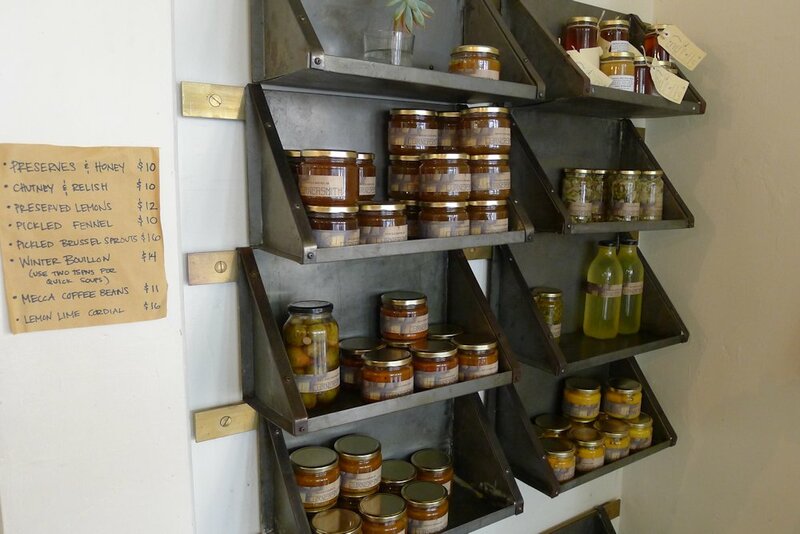 The plates are the absolute standout and picking up a jar of their home made preserves is a must. Only downside is the wait for a table though it did give us enough time to wander across to the vintage shop across the street.